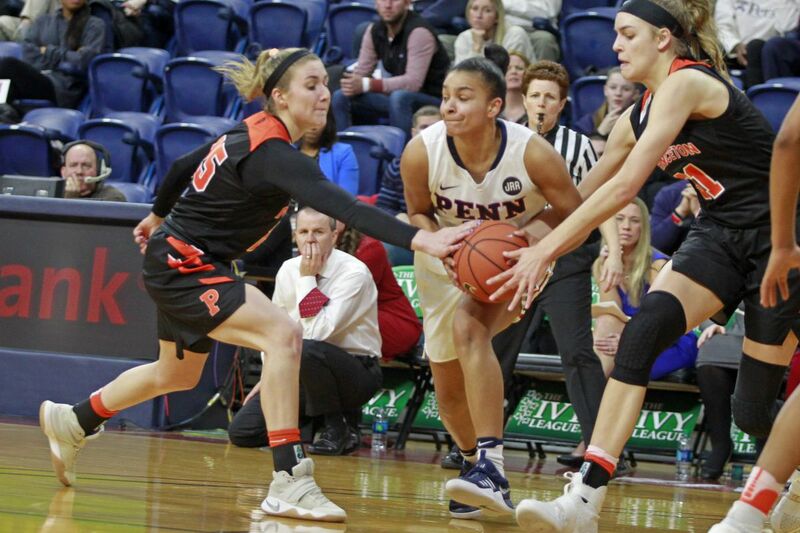 Penn guard Anna Ross had 12 points and four assists Friday in the Quakers’ win over Ivy League rival Columbia. Pictured is Ross in the Ivy League Championship game against Princeton last March. Alex Louin put up 20 points, but the Wildcats couldn't keep up with the Golden Eagles in a Big East loss on the road. Louin shot 7-for-13 from the field and was perfect 4-for-4 at the free throw line. She also had four rebounds and an assist. Mary Gedaka scored 10 points and grabbed seven rebounds off the bench. Megan Quinn also had 10 points as the starting center. Natisha Hiedman led Marquette with 26 points on 10-14 shooting. Erika Davenport followed up with 16 points and eight rebounds, and Danielle King and Allazia Blockton each added 15 points. Villanova stands at 20-6 overall and 10-5 in conference play, good for third in the Big East, with three games remaining in its regular season schedule. The Wildcats will travel to Chicago to face DePaul Sunday at 3 p.m.
Ashley Russell and Phoebe Sterba each scored 14 points to lead the Quakers in an Ivy League blowout of the home Lions. Russell shot 4-for-8 from the field, going 3-for-4 from three-point range. Sterba went 5-for-8 coming off the bench, shooting 4-for-7 from beyond the arc. Anna Ross added 12 points on 5-for-7 shooting and four assists. Michelle Nwokedi fell just shy of a double-double for the second straight game with nine points and 10 rebounds. Camille Zimmerman led Columbia with 12 points and 10 rebounds for the double-double, but was the Lions' lone double-digit scorer. Penn improved to 16-6 and 7-2 in conference play. The Quakers sit at second in the Ivy League with five games left in their regular season schedule. Penn will stay on the road to face Cornell Saturday at 4 p.m.